Figure A11. Atlantis anomaly, interpreted as the Atlantis slab, with (horizontal) [vertical] cross sections through (A)[D] the UUP07 p-wave) and (B)[D] the combined SL2013 and S40RTS s-wave models at 2710 km; C) the location of the modern geological record that we interpret to have formed during the subduction of the slab. 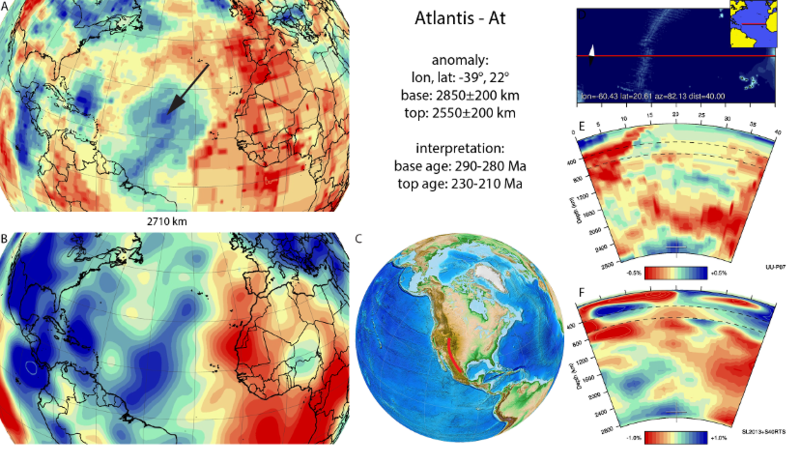 The Atlantis anomaly (Figure A11) is located below the central Atlantic Ocean, covers the core-mantle boundary, and was first identified in van der Meer et al. (2010). For instance, the Cocos slab and other slabs of the Farallon family higher in the mantle to the west leads us to interpret the anomaly as a slab with a pre-Jurassic subduction age. The slab is not connected to the Farallon slab family, and several correlations to the geological record were discussed in van der Meer et al. (2010), with a preferred interpretation that the Atlantis slab represents Panthalassa oceanic lithosphere that subducted along the western margin of Laurasia until the middle Triassic. Recently Hadlari et al. (2017) with a a synthesis of U-Pb detrital zircon data corroborated a Triassic subduction zone and continental magmatic arc system along western Laurentia. The disconnection of the Atlantis and Farallon slab family results from a pause in subduction along western Laurentia illustrated by a gap in magmatism at the western continental margin of Laurentia during the mid-Late Triassic (Ward, 1995; Nokleberg et al., 2000; Barboza-Gudiño et al., 2008; DeCelles et al., 2009).